Prime Minister of the Republic of Estonia Taavi Roivas who is JA-YE Europe alumnus opened the 25th Award Ceremony hosted by JA Estonia which gathered together 500 students from 37 countries, teachers, business advisors and partners to celebrate the success of their teams during the three days of competition (23-25th July). The student teams were part of JA-YE Europe flagship Company Programme, which sees students set up and run real businesses with the support of business mentors. 250,000 young people created student companies across Europe this year. The top 38 student companies were showcased in the 25th JA-YE Europe Company of the Year Competition. These enterprising secondary school students have all been running a business for a school year and they have received support from teachers as well as guidance from business volunteers. Each student company created and marketed real products and/or services, successfully dealing with the challenges of setting up and running a business. The Company Programme has had a positive impact on youth unemployment. JA-YE research has shown that alumni of the Company Programme are proven to be more employable (12% less likely to be weakly employed and fewer days of unemployment compared to over 20% less likely to be unemployed than the control group). Alumni are also more likely to start their own business and are more likely to have a higher average income in employment. “The teams who competed in Estonia were of an incredibly high standard showing an abundance of creativity and talent for innovation. But with unemployment at stunningly high levels, it is clear that we must do everything we can to help young people improve in teamwork, problem-solving and presentation. Competitions and pitching sessions like this are well-tried tools to push students, who quickly identify their strengths and weaknesses as far as their own skills are concerned.” Caroline Jenner, CEO JA-YE Europe. 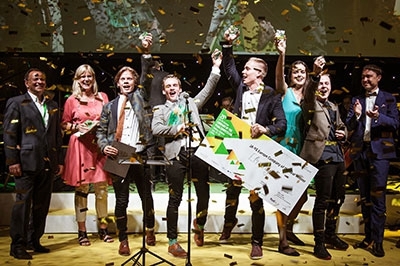 The runners-up in the competition were ACE from the UK for their revolutionary adhesive pad which is pressure sensitive; and Grades of Glory from Sweden who set up a tutoring company revolutionizing the study help market in Sweden by offering study help in cooperation with sport associations. Competing countries at this year’s final were: Albania, Austria, Belgium Flemish, Belgium French, Bulgaria, Cyprus, Czech Republic, Denmark, Estonia, Finland, France, Germany, Greece, Hungary, Iceland, Ireland, Isle of Man, Israel, Italy, Latvia, Lithuania, Luxembourg, Malta, Moldova, Netherland, Norway, Poland, Portugal, Romania, Russia, Serbia, Slovakia, Slovenia, Spain, Sweden, Switzerland, Turkey, and the United Kingdom. The Alumni Leadership Award is given to 15 standout individuals competing at the Company of the Year Competition. In 2014 the European Alumni Organization of JA-YE will give the award for fourth time to Company Program program students.